DIE Jovis, 10 die Januarii. Message to H. C. renewed, that House being up Yesterday. Reports of Conferences to be made. Estates upon Lives, Want of Proof, Bill. Report of Precedents of Impeachments for Misdemeanors. The Lord Chamberlain reported, "That the Committee have considered the Bill for uniting the Two Churches in Swaffham; and do think it sit to pass, with some Alterations." Which, being read Twice, were Agreed to; and the Bill is ordered to be engrossed accordingly. 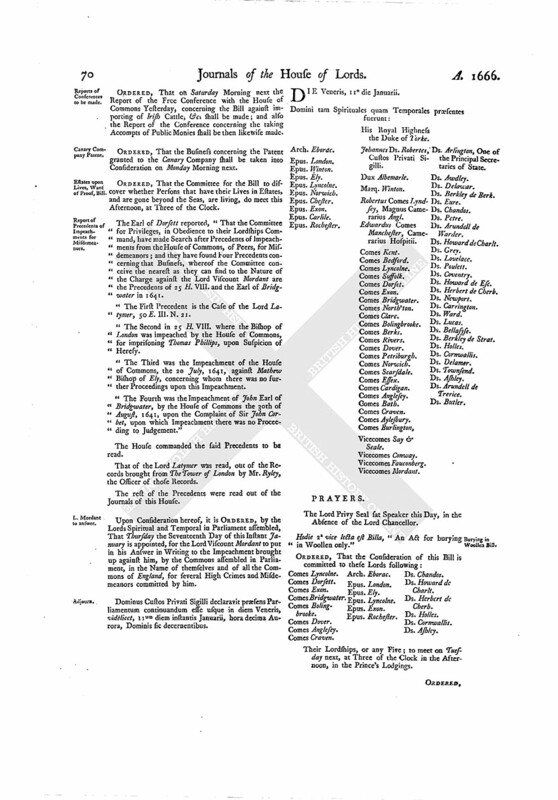 The House being informed, "That the House of Commons was up Yesterday before the Messengers could come to deliver their Message;" ORDERED, That the same Messengers should be now sent again, to desire a present Conference, in the Painted Chamber, by a Committee of both Houses, touching the Bill for encouraging of Coinage. Also to deliver the Bill passed this House concerning Leycester Grosevenor, and desire their Concurrence to the same. And also to return the Bill concerning the Lord Strangford, wherein the Lords have made a few Alterations, to which their Concurrence is desired. Lastly, to acquaint them, that this House hath passed the Earl of Cleveland's Bill. That the Commons will give a present Conference, as is desired; and that they have delivered the other Parts of their Message. The Lord Ashley was appointed to manage this Conference. A Message was brought from the House of Commons, by Sir George Downing, &c.; who brought up a Bill, intituled, "An Act for burying in Woollen only;" to which their Lordships Concurrence is desired. Hodie 1a vice lecta est Billa, "An Act for burying in Woollen only." Hodie 3a vice lecta est Billa, "An Act for restoring Francis Scawen Gentleman in Blood." ORDERED, That the Committee for the Lady Abergavenye's Bill do meet on Monday next, in the Afternoon, at Three of the Clock. ORDERED, That on Saturday Morning next the Report of the Free Conference with the House of Commons Yesterday, concerning the Bill against importing of Irish Cattle, &c. shall be made; and also the Report of the Conference concerning the taking Accompts of Public Monies shall be then likewise made. ORDERED, That the Business concerning the Patent granted to the Canary Company shall be taken into Consideration on Monday Morning next. ORDERED, That the Committee for the Bill to discover whether Persons that have their Lives in Estates, and are gone beyond the Seas, are living, do meet this Afternoon, at Three of the Clock. The Earl of Dorsett reported, "That the Committee for Privileges, in Obedience to their Lordships Command, have made Search after Precedents of Impeachments from the House of Commons, of Peers, for Misdemeanors; and they have found Four Precedents concerning that Business, whereof the Committee conceive the nearest as they can find to the Nature of the Charge against the Lord Viscount Mordant are the Precedents of 25 H. VIII. and the Earl of Bridgwater in 1641. "The First Precedent is the Case of the Lord Latymer, 50 E. III. N. 21. "The Second in 25 H. VIII. where the Bishop of London was impeached by the House of Commons, for imprisoning Thomas Phillips, upon Suspicion of Heresy. "The Third was the Impeachment of the House of Commons, the 20 July, 1641, against Mathew Bishop of Ely, concerning whom there was no further Proceedings upon this Impeachment. "The Fourth was the Impeachment of John Earl of Bridgwater, by the House of Commons the 30th of August, 1641, upon the Complaint of Sir John Corbet, upon which Impeachment there was no Proceeding to Judgement." The House commanded the said Precedents to be read. That of the Lord Latymer was read, out of the Records brought from The Tower of London by Mr. Ryley, the Officer of those Records. The rest of the Precedents were read out of the Journals of this House. 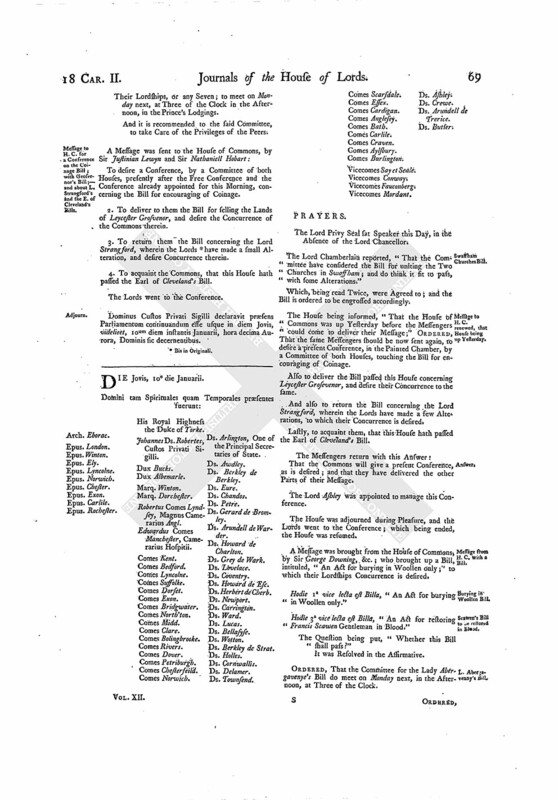 Upon Consideration hereof, it is ORDERED, by the Lords Spiritual and Temporal in Parliament assembled, That Thursday the Seventeenth Day of this Instant January is appointed, for the Lord Viscount Mordant to put in his Answer in Writing to the Impeachment brought up against him, by the Commons assembled in Parliament, in the Name of themselves and of all the Commons of England, for several High Crimes and Misdemeanors committed by him. Dominus Custos Privati Sigilli declaravit præsens Parliamentum continuandum esse usque in diem Veneris, videlicet, 11um diem instantis Januarii, hora decima Aurora, Dominis sic decernentibus.